This paper provides new and deeper evidence on the extent and the main characteristics of the deindustrialization process in the EU27 over the period 1995‒2011. This evidence is linked to the debate on the “manufacturing imperative” and the need for a renewed approach to industrial policy in the European Union. To investigate the issue, we adopt a subsystem approach, based on input‒output tables from the World Input‒Output Database, and decompose subsystems according to three different technological taxonomies. The analysis shows that the deindustrialization process affecting the EU27 is not homogeneous. Great differences exist between the EU15 and the other EU countries and among the technological classes of manufacturing. This evidence confirms and better delimits the effects of the hierarchical reorganization of the EU’s industrial structure and of the processes of intra-European offshoring described in the literature. 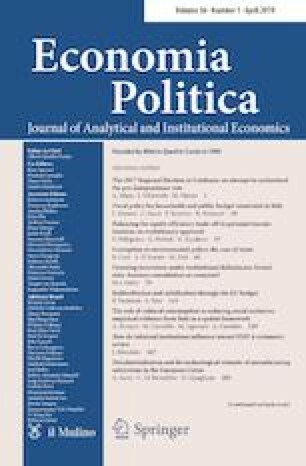 The general result is that the horizontal industrial policies, and in particular the horizontal innovation policies promoted since the early 1990s, appear to have failed to achieve the objective of strengthening the influence of high-technology production on economic growth across the European economies. See Tables 19, 20 and 21. Electrical machinery and apparatus, n.e.c. Bernard, A., Smeets, V., & Warzynski, F. (2016). Rethinking Deindustrialization (No. 22114). Nber Wp. Cambridge, MA. https://doi.org/10.1017/cbo9781107415324.004. Bramucci, A., Cirillo, V., Evangelista, R., & Guarascio, D. (2017). Offshoring, industry heterogeneity and employment. Structural Change and Economic Dynamics, (649186). https://doi.org/10.1016/j.strueco.2017.09.002. Bryson, J. R., & Daniels, P. W. (2010). Service Worlds. The “Services Duality” and the Rise of the “Manuservice” Economy. In P. Maglio, C. Kieliszewski, & J. C. Spohrer (Eds. ), The handbook of service science (pp. 79–104). New York: Springer US. https://doi.org/10.1007/978-1-4419-1628-0_6. De Backer, K., Desnoyers-James, I., & Moussiegt, L. (2015). Manufacturing or Services—That is (not) the Question. The Role of Manufacturing and Services in OECD Economies. Paris: OECD Publishing. https://doi.org/10.1787/5js64ks09dmn-en. Goodwin, R. M. (1983). Use of normalised general co-ordinates in linear value and distribution theory. In Essays in Linear Economic Structures (pp. 130–152). London: Palgrave Macmillan UK. https://doi.org/10.1007/978-1-349-05507-4_7. Kuznets, S. (1961). Quantitative aspects of the economic growth of nations: VI. Long-term trends in capital formation proportions. Economic Development and Cultural Change, 9(4, Part 2), 1–124. https://doi.org/10.1086/449936. Landesmann, M. A., & Scazzieri, R. (1993). Commodity flows and productive subsystems: An essay in the analysis of structural change. In M. Baranzini & G. C. Harcourt (Eds. ), The dynamics of the wealth of nations (pp. 209–245). London: Palgrave Macmillan UK. https://doi.org/10.1007/978-1-349-22728-0_9. Miller, R. E., & Blair, P. D. (2009). Input–output analysis: Foundations and extensions. Cambridge: Cambridge University Press. http://www.cambridge.org/it/academic/subjects/economics/econometrics-statistics-and-mathematical-economics/input-output-analysis-foundations-and-extensions-2nd-edition?format=HB&isbn=9780521517133#dILybG9hpvbHXg6P.97. Accessed 30 Jan 2018. Momigliano, F., & Siniscalco, D. (1982). Note in tema di terziarizzazione e deindustrializzazione. Moneta e Credito, 35(138), 143–182. http://econpapers.repec.org/article/pslmoneta/1982_3a22.htm. Accessed 25 May 2017. Pack, H., & Saggi, K. (2006). Is there a case for industrial policy? A critical survey. The World Bank research observer, 21(2 (Fall 2006)), 267–297. http://documents.worldbank.org/curated/en/288741468326136798/Is-there-a-case-for-industrial-policy-A-critical-survey. Accessed 29 Jan 2018. Palma, J. G. (2014). De-Industrialisation,’Premature’ De-Industrialisation and the Dutch-Disease. Revista NECAT, 3(5), 7–23. http://stat.ijie.incubadora.ufsc.br/index.php/necat/article/view/3118. Pasinetti, L. (1965). A New Theoretical Approach to the Problems of Economic Growth. In R. McNally (Ed. ), Econometric approach to development planning (pp. 571–696). Amsterdam: North Holland Publishing Company. https://publicatt.unicatt.it/handle/10807/65271#.WnA2T2ah2L4. Accessed 30 Jan 2018. Pasinetti, L. (1983). Structural change and economic growth: A theoretical essay on the dynamics of the wealth of nations. Cambridge: Cambridge University Press. http://www.cambridge.org/it/academic/subjects/economics/economic-development-and-growth/structural-change-and-economic-growth-theoretical-essay-dynamics-wealth-nations?format=PB&isbn=9780521274104#dYseQ0PypVAMeGCT.97. Accessed 29 Jan 2018. Pasinetti, L. (1993). Structural economic dynamics—a theory of the economic consequences of human learning. Cambridge, MA: Cambridge University Press. https://publicatt.unicatt.it/handle/10807/65223#.WnA3VGah2L4. Accessed 30 Jan 2018. Pianta, M. (2014). An Industrial Policy for Europe. Seoul Journal of Economics, 27(3), 277–305. https://papers.ssrn.com/sol3/papers.cfm?abstract_id=2530344. Pilat, D., & Wölfl, A. (2005). Measuring the interaction between manufacturing and services. OECD Science, Technology and Industry Working Papers, 5. https://doi.org/10.1787/882376471514. Van Ark, B., Chen, V., & Jäger, K. (2013). European Productivity Growth Since 2000 and Future Prospects. International Productivity Monitor (pp. 65–83). http://www.csls.ca/ipm/25/IPM-25-vanArk-Chen-Jager.pdf. Warwick, K. (2013). Beyond industrial policy. Emerging issues and new trends. OECD Publishing. https://doi.org/10.1787/5k4869clw0xp-en.